The extracellular matrix of animal cells holds cells together to form a tissue and allow tissues to communicate with each other. 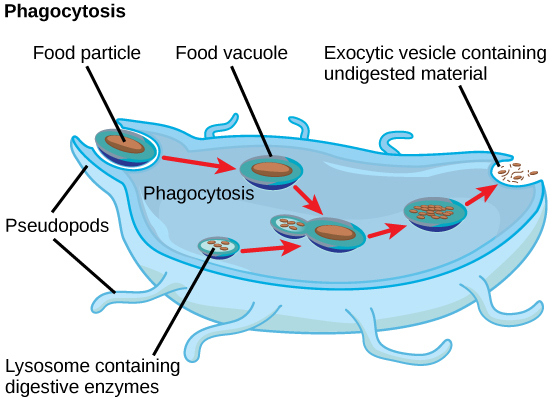 The extracellular matrix of animal cells is made up of proteins and carbohydrates. Cell communication within tissue and tissue formation are main functions of the extracellular matrix of animal cells. 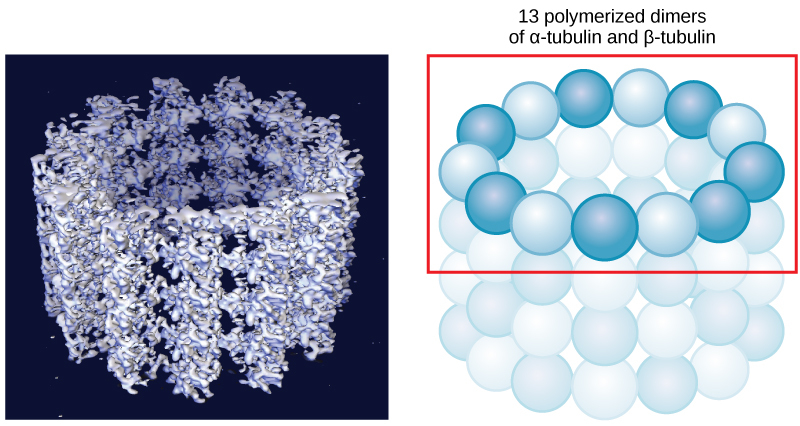 Tissue communication is kick-started when a molecule within the matrix binds a receptor; the end results are conformational changes that induce chemical signals that ultimately change activities within the cell. 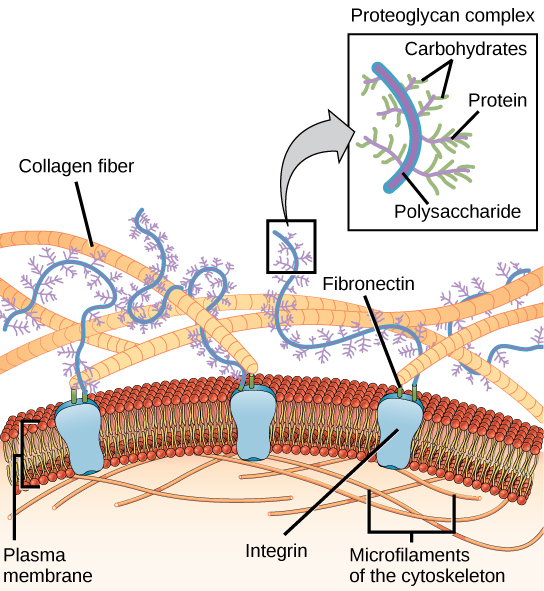 collagen: Any of more than 28 types of glycoprotein that forms elongated fibers, usually found in the extracellular matrix of connective tissue. extracellular matrix: All the connective tissues and fibres that are not part of a cell, but rather provide support. The Extracellular Matrix: The extracellular matrix consists of a network of proteins and carbohydrates. Most animal cells release materials into the extracellular space. The primary components of these materials are proteins. Collagen is the most abundant of the proteins. Its fibers are interwoven with carbohydrate-containing protein molecules called proteoglycans. Collectively, these materials are called the extracellular matrix. Not only does the extracellular matrix hold the cells together to form a tissue, but it also allows the cells within the tissue to communicate with each other. How does this cell communication occur? Cells have protein receptors on the extracellular surfaces of their plasma membranes. When a molecule within the matrix binds to the receptor, it changes the molecular structure of the receptor. The receptor, in turn, changes the conformation of the microfilaments positioned just inside the plasma membrane. These conformational changes induce chemical signals inside the cell that reach the nucleus and turn “on” or “off” the transcription of specific sections of DNA. This affects the production of associated proteins, thus changing the activities within the cell. 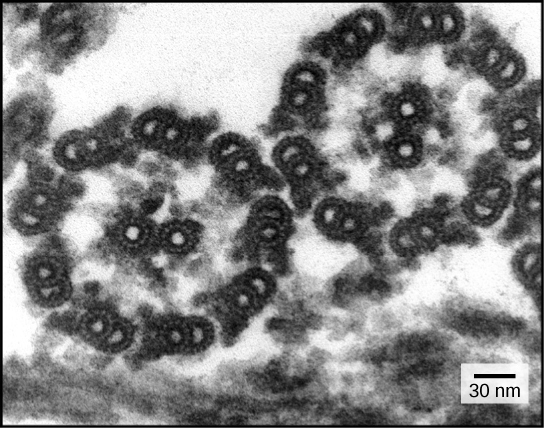 An example of the role of the extracellular matrix in cell communication can be seen in blood clotting. When the cells lining a blood vessel are damaged, they display a protein receptor called tissue factor. When a tissue factor binds with another factor in the extracellular matrix, it causes platelets to adhere to the wall of the damaged blood vessel and stimulates the adjacent smooth muscle cells in the blood vessel to contract (thus constricting the blood vessel). Subsequently, a series of steps are initiated which then prompt the platelets to produce clotting factors.